First I lightly sketch the subject onto a canvas using a pencil, after that I flung paint all over the original sketch from several large brushes and created a random splattering of various colors. When the splatters and drips dried I applied acrylic paint as a transparent wash to fill in large areas with pale color. 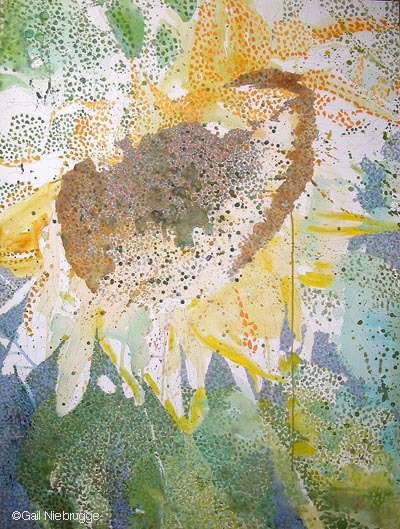 Next, I begin the time consuming task of layering opaque acrylic dots in mid-values on top of the transparent wash to begin developing the background leaves, petals, and the seed-filled center of the flower. The research for this painting took place several years ago in my back yard where this giant sunflower sprouted from a stray seed from the bird feeder. Fortunatley it landed in a flower bed and was easy to nurture. Hi…like the painting of the sunflower. I came here via ascender’s site.I am a ‘Hyperpointillist’..currently working on a series of small works, but usually work on larger pieces…I use ink. Please feel free to drop by my site and let me know what you think. Thanks for the comment. I love your pointillism work as well, it is hard to find people who paint this way. I’ve been using pointillism since 1989, and sometimes grow weary of it. As soon as I try to change though, I’m back to using dots again.